A simple guide on how to achieve the best ending including the developers note that comes with it. Before anything else you must realize that this guide contains major spoilers and would ruin the experience for someone who has not already played the game. Seriously go play it blind first! So you either have completed a blind run of the game (and you really want closure and for everyone to be happy), or you just want to get the best ending. Well, I created this guide for the purpose of helping other players make everyone in the literature club happy! My experience: I did a blind run of the game, no save reloading or anything just balls out making decisions and I ended up with the usual ending that one receives after a straight playthrough, which can be summed up as Just Monika, everyone else had been deleted and I didn't really know what to do from there and the game messed with my head. Next I will talk about how to begin your playthrough to actually beat the game instead of getting Monika in some void or whatever. Skip if you already have a clean game ready to play or have not played it yet. Now if you ended up with the Just Monika ending then this will be important for you, but if you already have a fresh game ready then you can ignore this section. If this is your situation, then evertime you launch the game it will place you in the room with Monika and there isn't really anything you can do about it because you are not able to access the main menu. However you don't need to reinstall the game or whatever it's very simple to fix this and get back to the start of the game. It requires a bit of file work though. First you must go to your DDLC steam folder (which can be accessed by right clicking Doki Doki Literature Club in your Games Library, clicking Properties, Selecting Local Files on the top bar, and selecting Browse Local Files). From here you must enter the folder labeled "game" and locate the file "firstrun." Throw out firstrun and upon launching the game a second time you will be prompted to start a new game and find yourself at the main menu of a clean DDLC game hooray. Now you can begin the new playthrough. The way to achieve the dev's special ending is to get all of the cutscenes for each character Now that you have a clean game you may now start a new one. If you have already played the game blindly and wish to skip all the dialogue that you have already seen, then you can go into the settings and set it so that you are able to skip unseen dialogue as the new game is not aware that you have read all of this already. Now you will be playing three different runs of the game. This first run you will appeal to Sayori. Make sure that the words you select in the poem minigame appeal to Sayori, there are other guides showing which words appeal to Sayori, but it is easy enough to choose words that are bittersweet. Your goal in this first playthrough is to achieve all of Sayori's special scenes. There are three in total for each character. The first two are achieved by writing your poems for her and the last one must be achieved by selecting the option to confess your love to Sayori. It does not matter who you decide to help prepare for the festival here as you will be prompted to confess to Sayori either way as she always will come over afterwards. This run you will do pretty much the exact same way you did Sayori's except you will be appealing to Natsuki. Select words for your poems like "fluffy" and "cute" to get all of the cutscenes with Natsuki. You must view the first two cutscenes, and any time you are given choices you must appeal to Natsuki. 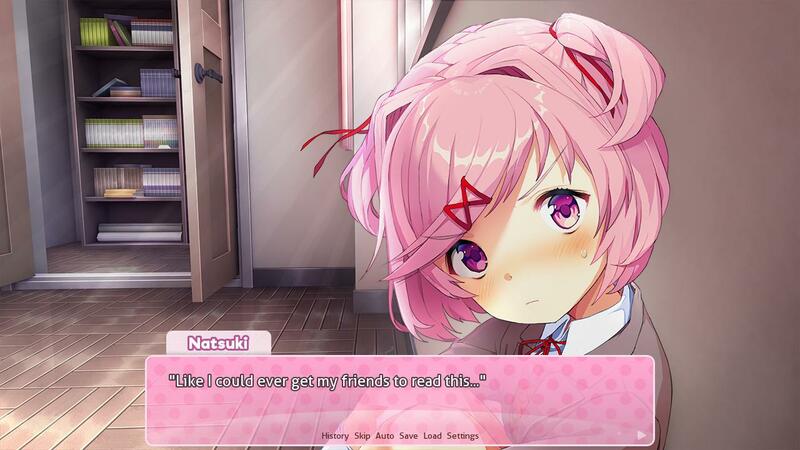 The third cutscene with Natsuki must be achieved by choosing to help her prepare for the festival. You will bake the cupcakes and get the third and final cutscene with Natuski here. 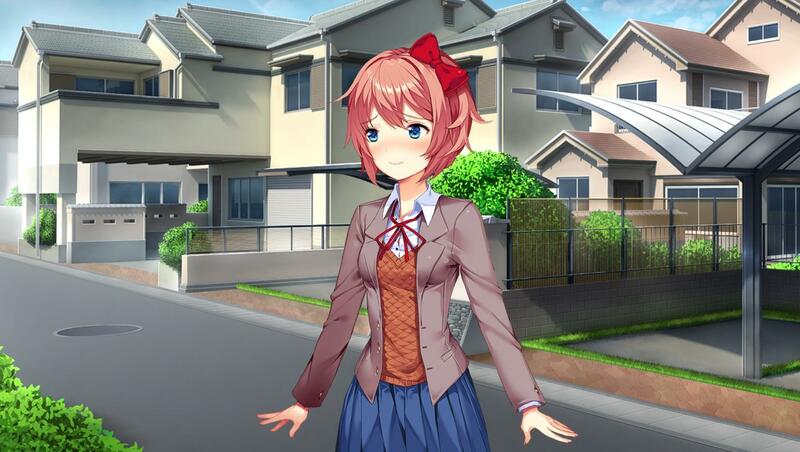 The same events will play out afterwards with Sayori coming over and you being prompted to confess to her. This option does not really matter anyways because she will, as stated earlier, always kill herself. Again, when you reach the point where you go to check on Sayori to find that she is dead, do not view this scene. Simply start a new game before this scene just as you did before. Now that you have gotten the 3 cutscenes for Sayori, and the 3 cutscenes for Natsuki, you just need to get the 3 for Yuri. 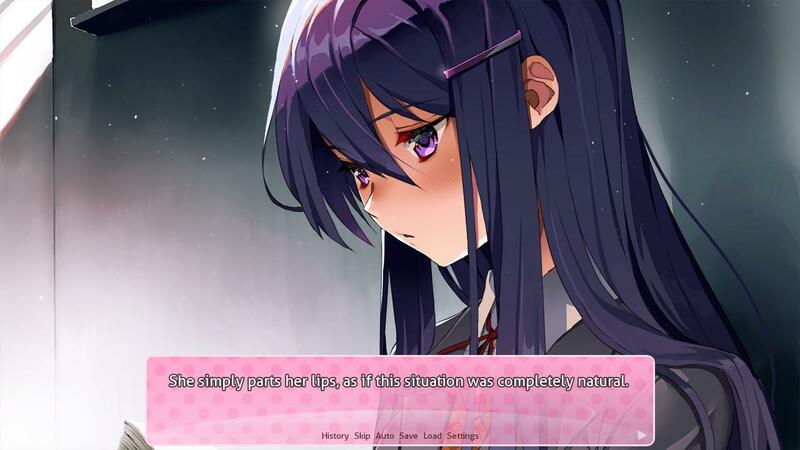 Yuri's first two cutscenes must be achieved by writing your poems for her, just like the others. Once you get these two cutscenes you must select her to help prepare for the festival. This run is pretty much identical to Natsuki's as when she comes over you will get the third cutscene, and once again Sayori will come over afterwards and give you the same choices as before. These choices do not matter as usual and will not impact the outcome of the game, however you will not start a new game this time, instead you will have to go through the scene of sayori's death..
After you view Sayori "hanging out" in her room you will be back at the main menu and Sayori's character will be all glitched. You then select to continue rather than start a new game. This section of the game, which is after Sayori's death, will always play out the same. It will just be the same exact story except Sayori will not be existent and the a bunch of bad stuff will happen, making the characters go crazy. The decisions you make from this point on in the game do not matter as they always end with Monika deleting the other two girls, and giving them the same fates as Sayori (her first victim). 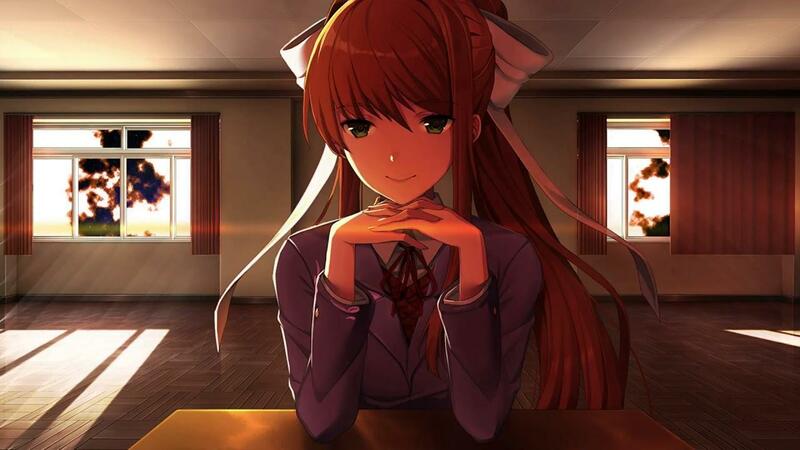 You will end up with the Just Monika scene in some void like atmosphere just as you did before, however now that you have "collected" all 9 of the individual character cutscenes you are now worthy of receiving the wholesome ending. Go to your DDLC game folder just as you did before, and go to the characters folder. You will notice that now that the only file in that folder is Monika's character file, making it easy to click on it and throw it away. Yes, you gotta throw away Monika to get the good ending. Now when you return to the game Monika will be broken and she will have some dialogue for you. After you get through this dialogue the game will bring you to the main menu, but Monika is missing from the game now. You will start a new game and it will play out pretty normally then. Now that you are playing the game without Monika, it will play out pretty nice and you will have to go through some dialogue to get to the final scene, where Sayori will talk to you and it will be all sad and the credits will roll. Afterwards you will hear Monika's song and then the game will pretty much destroy itself in the console and you will be left with the developers note on the screen. Upon closing and relaunching the game, you just get the dev note again and the game is broken again. The deleting of "firstrun" can fix this if you want to play again and do some more experimenting. This is what should happen if you do everything correctly and view all 9 cutscenes. However, if at the end you talk to Sayori and she says some really yandere stuff and basically becomes like Monika and the game starts glitching then you must have missed a cutscene. You are able to see which cutscene you missed by viewing the end credits and each picture that rolls will be a cutscene. The cutscenes that you have viewed will be colored and the ones you haven't will be black and white. If you missed any of the cutscenes you won't get the correct ending and the game will get all messed up again and that's no fun right?